Another victory for the revolution! Pravda, sometime in the 80s. Today our comrades in Bongolesia delivered another nail to the capitalist coffin. The brave workers of Bongolesian Peoples' Democratic Liberation Front (not to be confused with misguided tribal assembly of Bongolesian Freedom Front, nor the capitalist supported Bongolesian Liberation Army.) were supported by few of our own tourists, who in the brave revolutionary spirit joined the cause and took the arms against the oppressive regime. 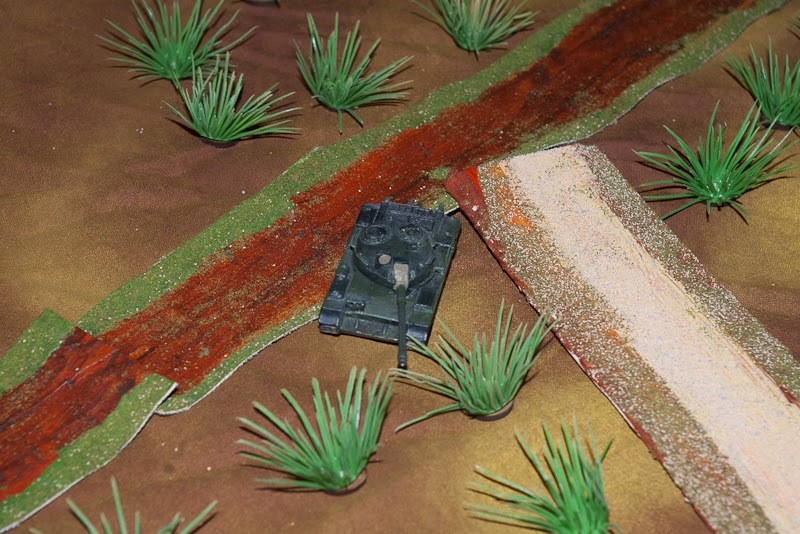 The capitalist pig had fled from our first attack and left a T55 tank on the roadside, which our brave volunteers promised to capture and bring back to home. Area around the Wilson Farm and the new village. BPDLF arrives from the top. The enemy had left only a token force by the abandoned Wilson Farm and they promptly fled when our brave men arrived. The volunteers manned the tank, in the true revolutionary spirit comrade Vladimir, having lots of expertise driving various tracked vehicles, was elected the commander and he guided the crew with a fatherly hand. 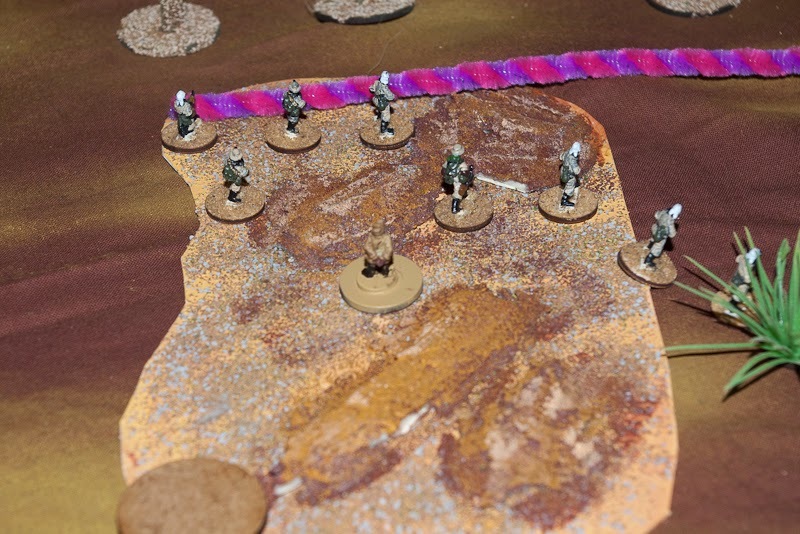 Our braves quickly formed a firing line, protecting the precious steel beast and started their advance. 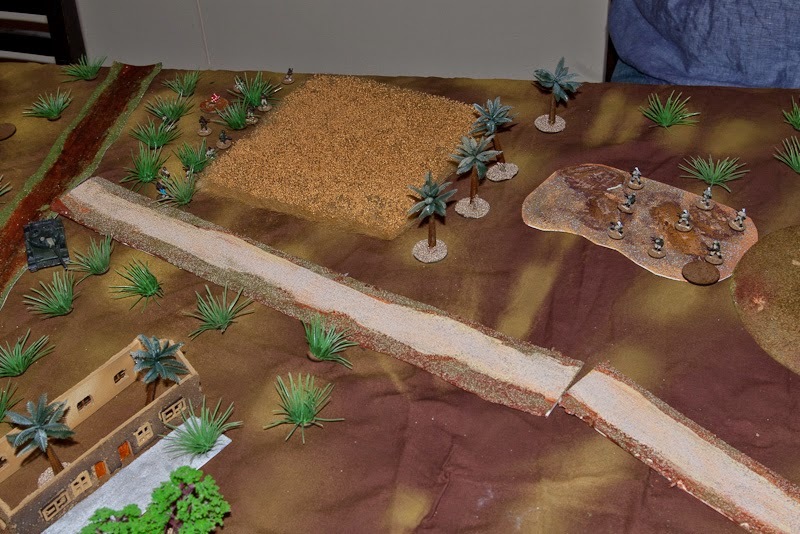 End of the patrol phase, regular markers in a tight line across the road. 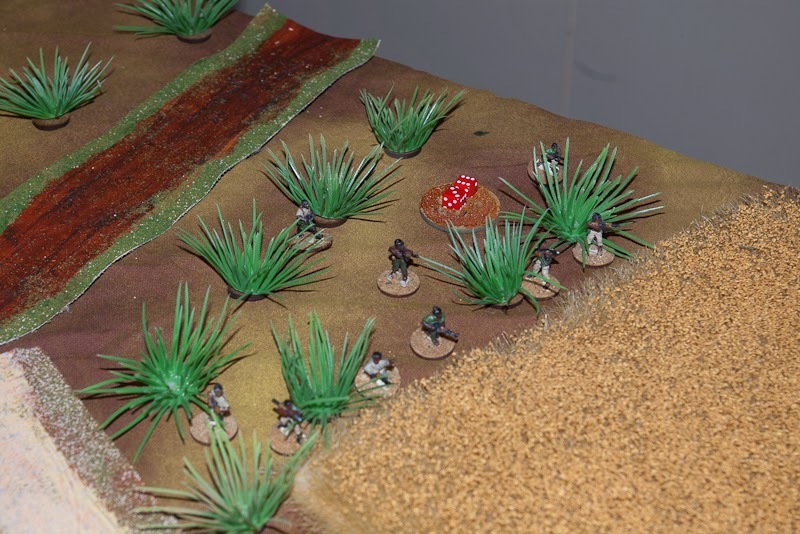 Enemy was sighted in the rough terrain a bit too close to the tank, so the 1st squad deployed on the left flank in the tall elephant grass, taking the enemy point under fire. Both open fire. 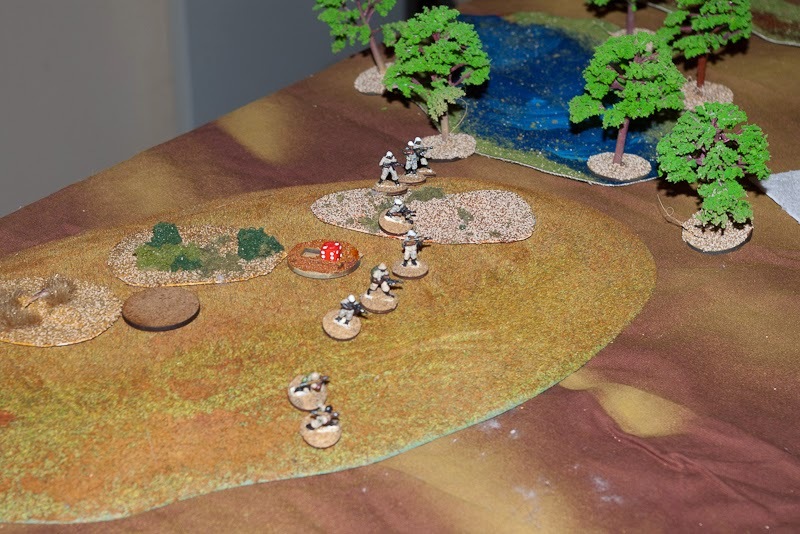 Regulars suffer greatly from their deployment, most being unable to fire. 9 shock after first regular phase, not so good. 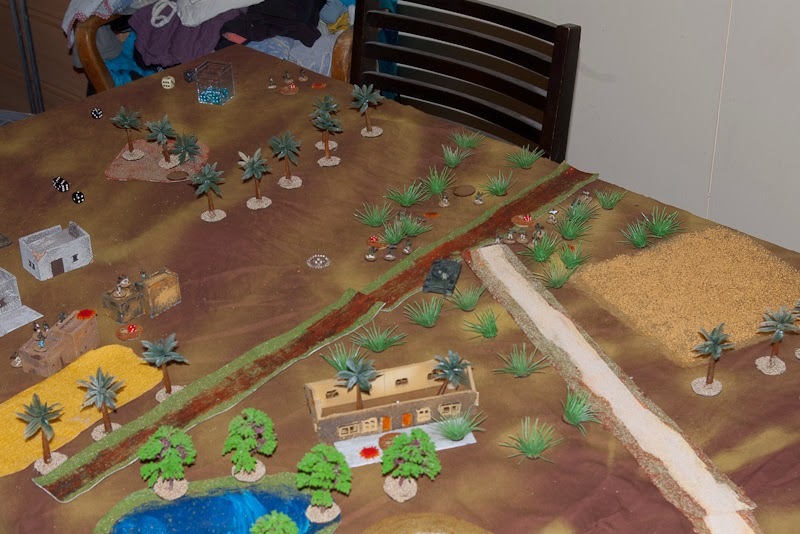 As expected, this forced the hated enemy to reveal his forces; a tank killer team and another squad took position on a hill overlooking the farm. 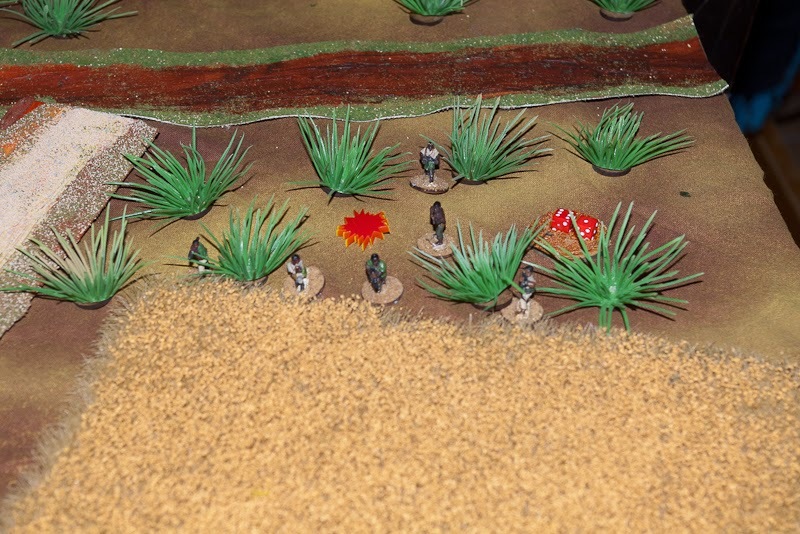 Platoon sergeant arrives and sorts out the firing line. Note the fancy measuring stick borrowed from son's craft box. Unfortunately for them, a DShK aa machine gun was sited at the village - capitalists did not have time to even get scared, as tracers mercilessly cut them down. Even the enemy armoured car cancelled its' support mission and drove to safety. 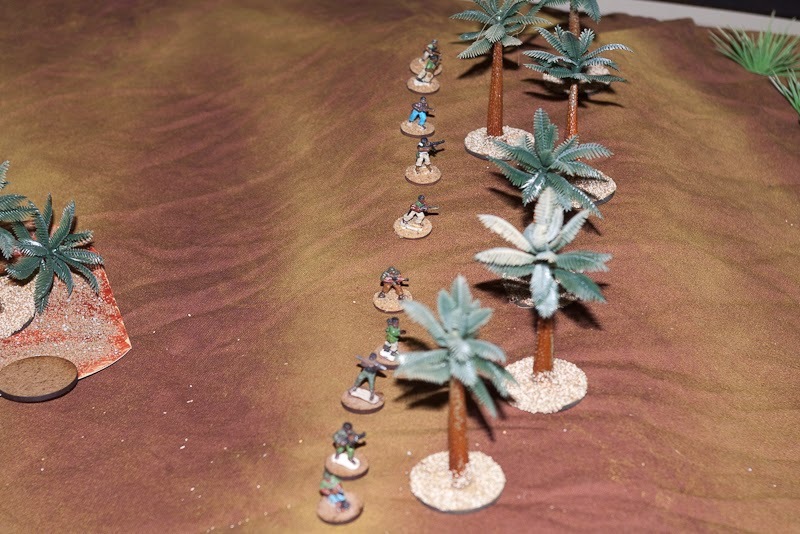 DsHK and supporting squad deploys. Dabir, ex-medicine man, now a commissar of the revolutionary army, took over the wavering 1st squad and without any regard to his own life kept enemy under fire. 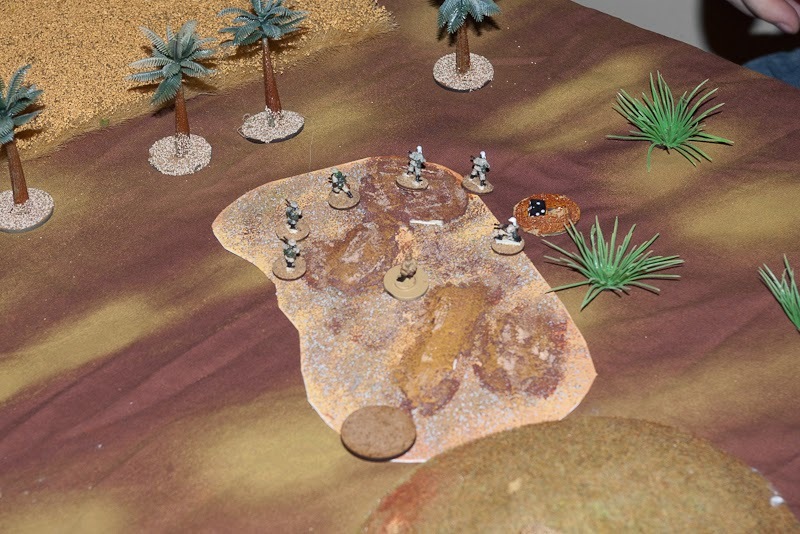 Our brave men were taking fore from at least 3 enemy units, not yielding an inch before Dabir gave them the signal to slightly withdraw. 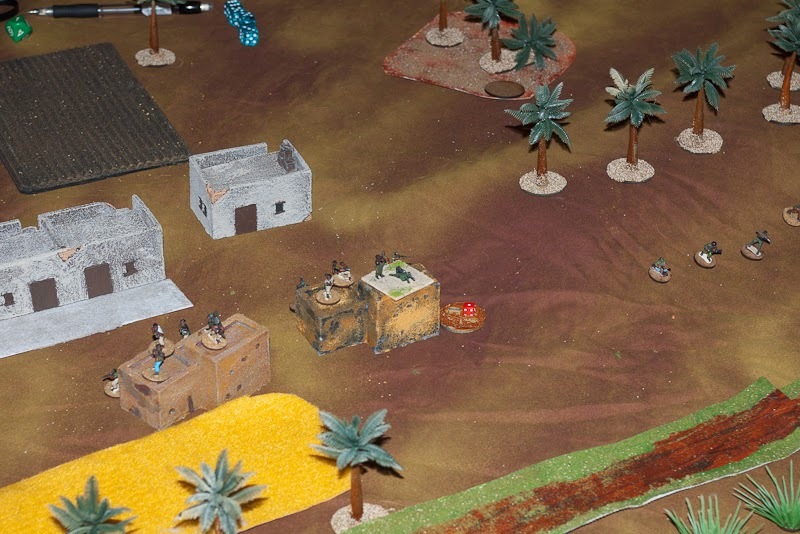 1st BPDLF squad stays in the firing position, more afraid of their medicine man that enemy. 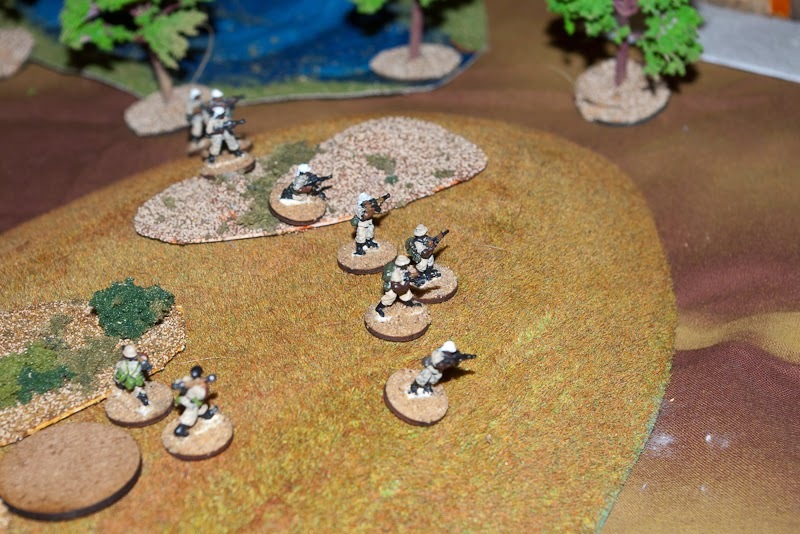 More troops deploy, ready to close in. 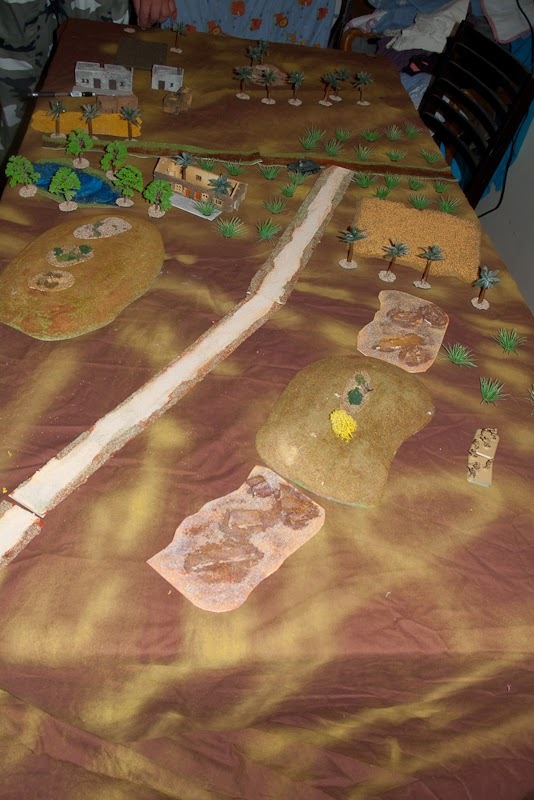 At this stage comrade captain Ibrahim gave the signal to deploy 2 remaining squads on the hill and in the elephant grass, aiming to punch through the suppressed enemy line. Unfortunately the enemy artillery finally got online and started a barrage, enveloping both his own lead squad and our men. For a brief moment confusion reigned, but the Vladimir's team finally managed to start the tank. Enemy RPG7 team tried to knock the socialist steel behemoth down, but as expected, were found wanting in both manhood and accuracy. 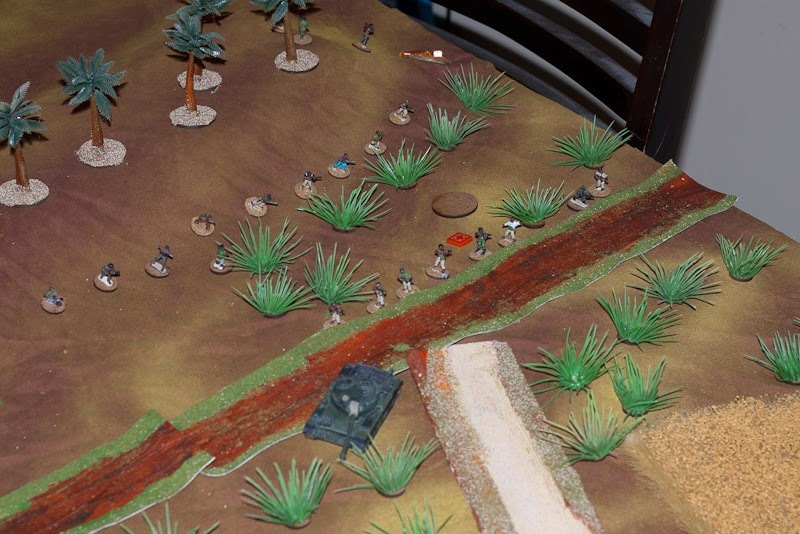 Our rifle troops surged forwards; making sure that the tank could disengage into safety. Arty arrives, tank engine rumbles to life. Many a brave worker fell, but the capitalist oppressors lost the battle. Enemy repulsed with almost no casualties, but a tank lost. A loss of face (and head) for platoon leader, an opportunity for his 2nd-in-C.
Nicely done. 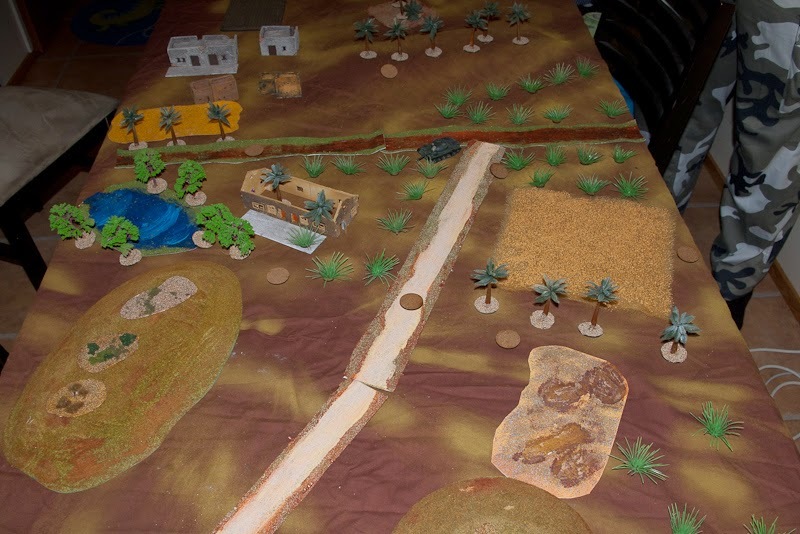 I have been wanting to use Chain of Command for a Lebanon game or two. This might just motivate me to try it out.